Relevance RIP140 is a ligand-dependent corepressor for most nuclear receptors, and functions through interaction with their AF2 activation domains. Modulates transcriptional activation by steroid receptors such as NR3C1, NR3C2 and ESR1. 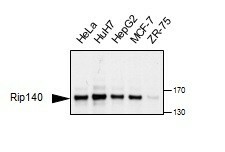 Also modulates transcriptional repression by nuclear hormone receptors. Foulds et al. 2013. Mol Cell. 51(2):185-99. PMID: 23850489. Proteomic analysis of coregulators bound to ERα on DNA and nucleosomes reveals coregulator dynamics. Poliandri et al. 2011. J Biol Rhythms. 26(3):187-99. PMID: 21628546. Hallberg et al. 2008. Mol Cell Biol. 28(22):6785-95. PMID: 18794372. A functional interaction between RIP140 and PGC-1alpha regulates the expression of the lipid droplet protein CIDEA. Herzog et al. 2007. Mol Endocrinol. 21(11):2687-97. PMID: 17684114. Kiskinis et al. 2007. EMBO J. 26(23):4831-40. PMID: 17972916. RIP140 directs histone and DNA methylation to silence Ucp1 expression in white adipocytes. The nuclear receptor cofactor, receptor-interacting protein 140, is required for the regulation of hepatic lipid and glucose metabolism by liver X receptor.